Note: Because of issues with the fast affiliates last week, the “Last Week” numbers for the networks are based on the final national numbers. Other than that, all that I have noted at the bottom of this page holds true for this night. CBS finished in first place for the evening with a 5.2/9 household rating/share, 8.36 million viewers and a 2.9/9 rating/share among adults 18-49. 7:00 p.m.: CBS NCAA Men’s Basketball Tournament (4.5/9 HH rating/share, 7.05M viewers, 2.4/9 A18-49 rating/share). 9:35 p.m.: CBS NCAA Men’s Basketball Tournament (5.6/9 HH rating/share, 8.90M viewers, 3.3/11 A18-49 rating/share). ABC followed in second place for the evening with a 3.8/7 household rating/share, 5.60 million viewers and a 1.7/5 rating/share among adults 18-49. 8:00 p.m.: Wife Swap (3.3/6 HH rating/share, 4.85M viewers, 1.6/6 A18-49 rating/share). 9:00 p.m.: Supernanny (3.5/6 HH rating/share, 5.34M viewers, 1.6/5 A18-49 rating/share). 10:00 p.m.: 20/20 (4.5/8 HH rating/share, 6.63M viewers, 1.8/6 A18-49 rating/share). NBC finished in third place for the evening with a 3.0/5 household rating/share and 4.60 million viewers but was fourth among adults 18-49 with a 1.3/4 rating/share. 8:00 & 8:30 p.m.: Howie Do It & Howie Do It-REPEAT (2.4/4 HH rating/share, 3.89M viewers, 1.0/4 A18-49 rating/share). 9:00 p.m.: Friday Night Lights (2.5/4 HH rating/share, 3.84M viewers, 1.2/4 A18-49 rating/share). 10:00 p.m.: Dateline (4.1/7 HH rating/share, 6.07M viewers, 1.7/6 A18-49 rating/share). FOX followed in fourth place for the evening with a 2.4/4 household rating/share and 3.89 million viewers, but managed a third place finish among adults 18-49 with a 1.4/4 rating/share. 8:00 p.m.: Terminator: The Sarah Connor Chronicles (2.3/4 HH rating/share, 3.65M viewers, 1.3/5 A18-49 rating/share). 9:00 (9:01) p.m.: Dollhouse (2.6/5 HH rating/share, 4.13M viewers, 1.5/5 A18-49 rating/share). The CW finished in fifth place for the evening with a 1.0/2 household rating/share, 1.52 million viewers and a 0.6/2 rating/share among adults 18-49. 8:00 p.m.: Everybody Hates Chris (1.59M viewers, 0.6/2 A18-49 rating). 8:30 p.m.: The Game (1.66M viewers, 0.7/2 A18-49 rating). 9:00 p.m.: America’s Next Top Model-REPEAT (1.42M viewers, 0.6/2 A18-49 rating). Note: Network average numbers from the week prior are based on fast affiliate data. Comparison’s from the week prior (or episode-to-episode, etc.) on specific shows are based on final national data. Ratings for the current day are based on fast affiliates. (Expect all three scenarios to be the case at all times, unless otherwise noted). The final rating for first-run episodes that aired this evening will be reported the following week. 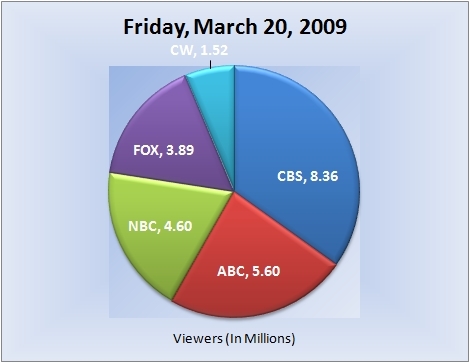 So for example, the final rating for tonight’s episode of “20/20” will be reported in next weeks report for Friday, March 27, 2009. Also keep in mind that because these are fast affiliate numbers, when the finals are released there may be noticeable changes.